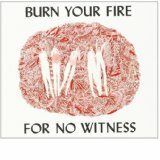 And this is how Angel Olsen’s second album, and first for Jagjaguwar, Burn Your Fire For No Witnessstarts out. As you get deeper into the album, Olsen, along with producer John Conglton favour minimal arrangements, letting the vocals mingle with spare instrumentation. The hushed lament of album closer “Windows” and acoustic “Iota” are great examples. But both contain subtle power, the percussion swell in the former and a bass drum that sounds like bombs going off in the distance on the latter. Burn Your Fire… is beautiful, angry, loving and sad all at the same time. This range of emotion makes Angel Olsen’s first full band release, a very compelling listen.